TARIFFS | How Are They All Working Out? Tariffs have not lowered the trade deficit so far. 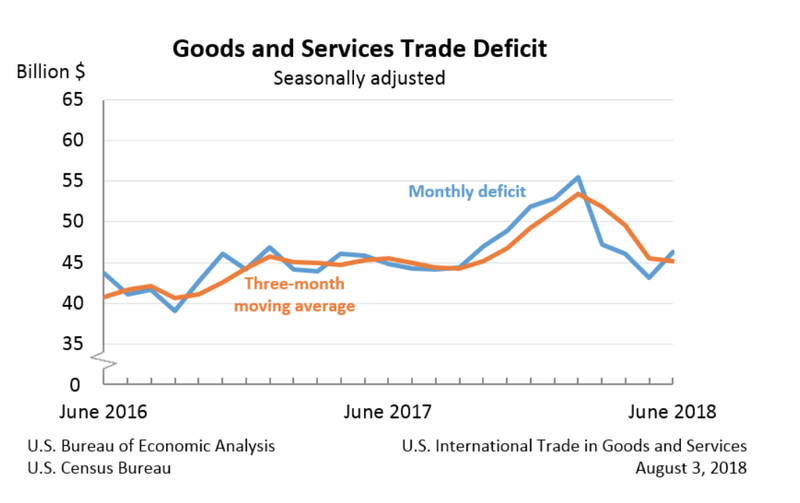 August 3, 2018–The Trump Administration is now more than year and a half into its program to improve the U.S. balance of trade in goods and services. The U.S. Bureau of Economic Analysis (BEA) reported this morning that the goods and services deficit was $46.3 billion in June, up $3.2 billion from $43.2 billion in May, revised. Year-to-date (see chart), the goods and services deficit increased $19.6 billion, or 7.2 percent, from the same period in 2017. Exports increased $103.6 billion or 9.0 percent. Imports increased $123.2 billion or 8.6 percent. June exports were down from May by $1.5 billion to $213.8 billion. June imports were up from May by $1.6 billion to $260.2 billion. 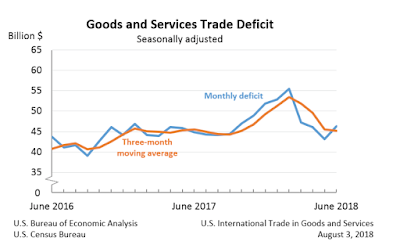 The June increase in the goods and services deficit reflected an increase in the goods deficit of $3.1 billion to $68.8 billion and virtually no change in the services surplus to $22.5 billion. A recent issue of the East Hampton Star editorialized about a “First District Dilemma for Democratic Voters” (July 5, 2018). I have been thinking about this. The editorial addresses the problem of deciding where to donate time and money in elections. 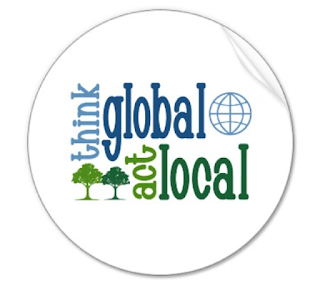 Does one give and work locally? Or is it better to send the money to national organizations that will allocate the money to where it is most likely to be effective. I think that depends on how much one knows about the local candidate. How involved are we? For someone with no time to address the issues, sending a check to a national group that is prioritizing its funding of local campaigns for the House and Senate is a good move. If you have enough money to max out in a local campaign and then give more to a national group, there is no dilemma. However, if a choice is really necessary, I have some experience to offer. I been volunteering for political campaigns for six decades and I have a point of view on what is effective. Just as investing in companies you understand is more likely to pay off than investment in schemes that you don’t, I have found that time or money spent on local campaigns has always been immensely more effective than the same effort or money invested in distant electoral districts. 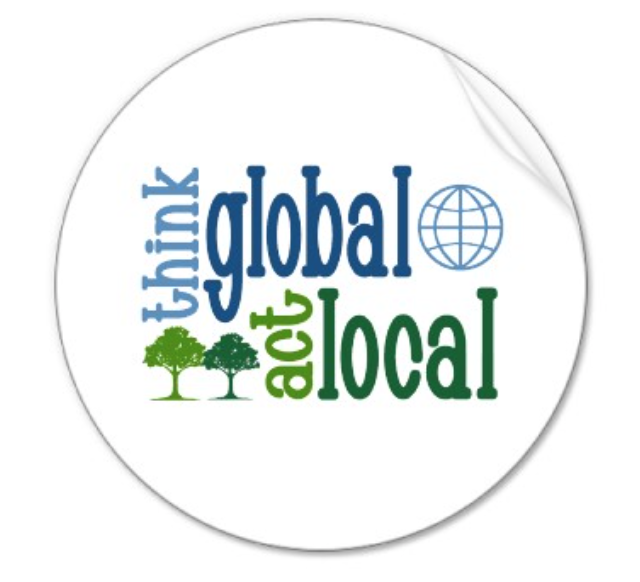 A concerted local effort is something we can control and evaluate. We can see the results. Bravo if you can help candidates from out of town as well as local ones, but we should not delude ourselves into thinking that money and volunteering spent in areas we don’t understand is as effective–or as appreciated!–as local involvement. So in New York Congressional District 1, where Perry Gershon is challenging Tea Party incumbent Lee Zeldin, my wife Alice and I are committing time and money to supporting Perry. He is a hugely superior candidate to Zeldin, someone who is on top of the issues that matter to me and apparently not to Zeldin. He won the Democratic Primary and received the support of all four of his opponents. There is a unity of purpose here that is rare in local politics. So if you are summering on the East End of Long Island, or live here, support Perry. Send an email to declan@perrygershon.com. Perry understands the issues and makes thoughtful decisions about policy, and his staff will respond promptly to your interest in giving money or time to his campaign.